Selling at the Eisenhower Lock Store is a Entrepreneur Package or higher benefit. If you have questions please email info@massenachamber.com or call us at 315-769-3525. *You must also be a entrepeneur member (or higher) of the Massena Chamber. Setting Up: The Lock store opens on Memorial day in May and ends on Labor Day in September. Dates to bring inventory to the lock will be provided near memorial day, and dates to pick up inventory will be provided near labor day. Restocking: To restock print out an empty inventory sheet and fill out normally. The sheet must be brought or emailed to the Massena Chamber before inventory can be brought out and displayed at the Lock Store. Online Store: Inventory under 5 lbs will be added to our online gift store. Staffing: Consigners can optionally staff the Lock store to receive better rates. One Shift a month will be (70/30) of your sold inventory, Two shifts a month will be (80/20) of your sold inventory, Four shifts a month will be (90/10) split on your inventory, Five shifts a month you’ll receive (100%) of your inventory revenue. Consignor shall be responsible for shipping/delivery costs to the Chamber. The Chamber promises to store the goods carefully and protect them from loss, damage or deterioration. The consignee is responsible for their own inventory totals at time of opening/closing of Locks store. Consignee will be responsible for ticketed pricing of all items and have list at locks store. Goods will remain the property of the consignor until sold to customers by consigner volunteers and employees supervised by the Chamber. Any unsold goods will be returned to the consignor at closing date. Proceeds of sales of the goods will be held in trust by the Chamber until accounted for and remitted to the consignor. The Chamber promises to keep accurate, computerized records of sales made of the consignor’s goods, and to split the proceeds of all sales 60/40 (or the agreed upon split), with the consignor receiving 60% and the Chamber 40% The consignor’s share of sales will be remitted no later than 30 days following the end of sales activities at Eisenhower Lock. All income taxes on proceeds to the consignor shall be paid by the Consignor. All sales taxes on sales made by the Chamber will be paid by the Chamber. The term of this agreement shall begin May 20, 2019 and shall remain in force until September 3, 2019 or until either Party gives at least 10 days prior written notice to terminate this agreement. Upon termination, the Chamber shall return all Consigned Goods to the consignor and shall arrange for payment of the Proceeds of sales owed. By typing your name below you are agreeing to have read and accepted the terms above. to fill the form out right in the browser. Would you like to fill out the Inventory sheets now? You will need to get the inventory sheets to us by as soon as possible. Your items can not be sold until they are input into our square system. Continue to next page to fill out inventory sheets. This section will be for clothing inventory, or items that come in a variety of sizes but are the same design or object. Example of a non-clothing item might be Chocolate Candy, which could include snickers, heresy bars, and M&Ms. 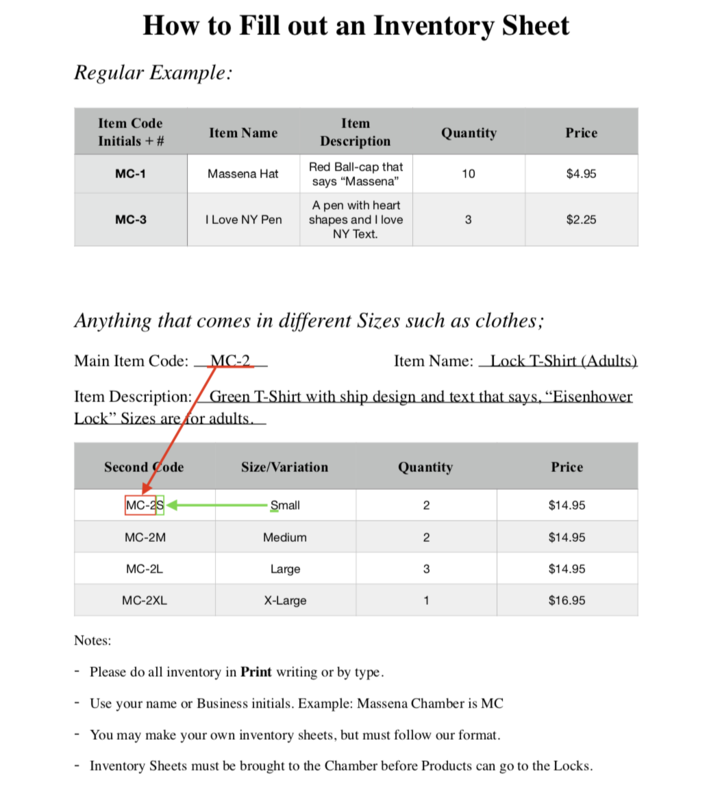 Use your business or name's initials in your item code. For example, Massena Chamber is MC. Our first item would be labeled MC-1. How many "types" clothing or size variation items do you have? None 1 2 3 4 5 6 7 8 9 10 Do not count different sizes, only the types: Example: I have Red, Blue, and Green shirts which makes 3 types. Press next to fill out a regular inventory sheet. Would you like to volunteer and get a better split rate? How many shifts per month? is open. Ex.) 5 shifts in June, 5 shifts in July, etc. Shifts will usually be 4-5 hrs long. We'll check in with you to schedule some dates.